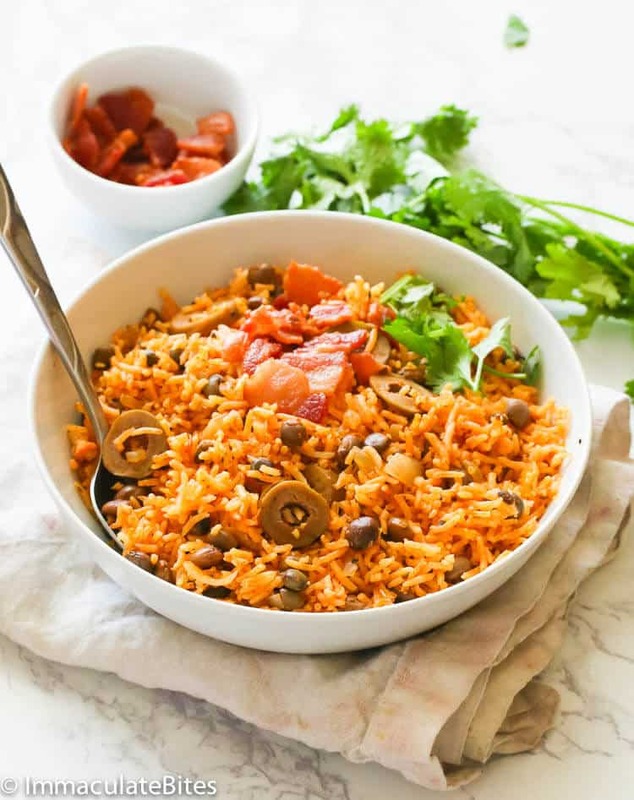 Arroz con Gandules – a classic Puerto Rican savory rice dish cooked with meat, gandules (aka pigeon peas) and some olives then spiced up with a homemade sofrito for an extra delicious rice meal! 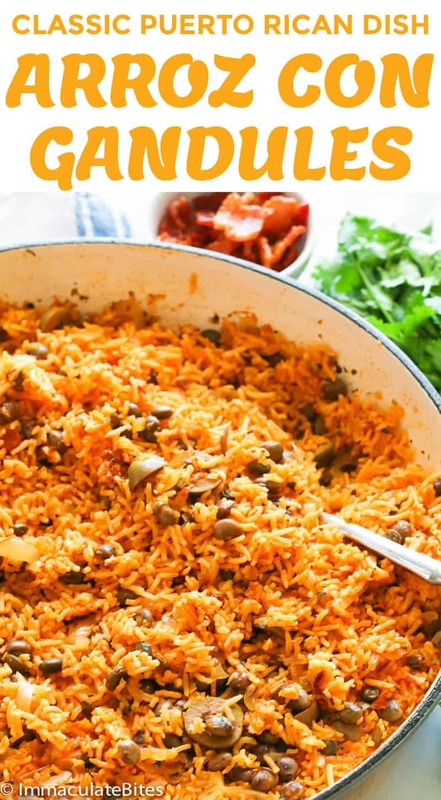 After re stashing my pantry with this homemade sofrito , I decided to cook a big pan of Arroz con Gandules, also known as Puerto Rican Rice with Pigeon Peas for the whole family to go along with my smash hit Pernil (Puerto Rican Roasted Pork). And we hardly ever spoke to each other while we dig in heartedly to our Puerto Rican-themed dinner. 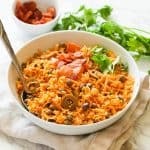 While Arroz con Gandules is mainly served during Christmas, birthdays and other special occasions, it sure makes a perfect family weeknight meal on regular days. What is gandules in English? 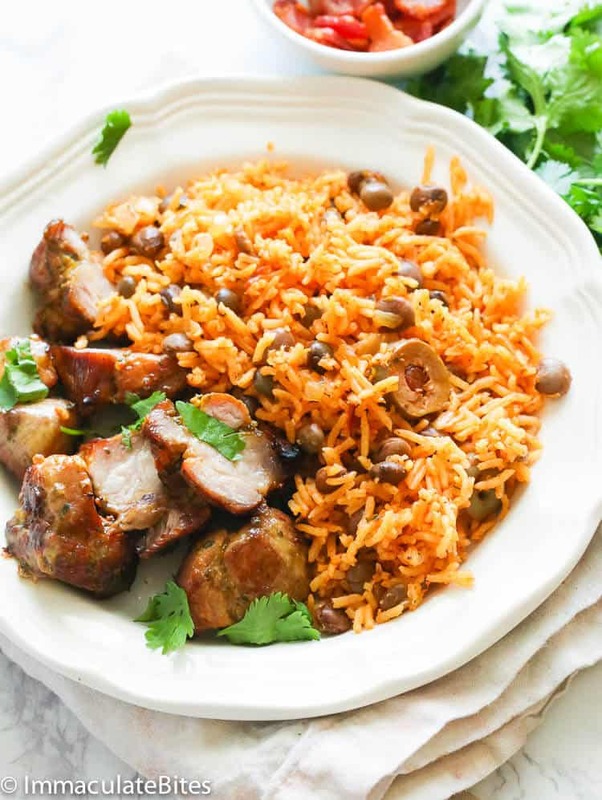 Arroz con Gandules is a popular Puerto Rican rice dish with different variations, although, the most basic ingredient of it is a sofrito sauce, added with pork (this time, I used bacon) and gandules. Gandules or Pigeon Peas in English is an essential ingredient in making Arroz con Gnadules. It’s popular throughout the Caribbean. They are small, oval peas with a nutty flavor. They come in fresh, frozen, boiled and canned. For this recipe, we use a canned and drained pigeon peas. You can also buy them fresh or frozen in Latin or Caribbean food markets. If you can’t find any pigeon peas, you can substitute them with canned pinto or red beans. This rice dish won’t be truly authentic without this mighty sofrito sauce – the heart and soul of Puerto Rican cuisine. 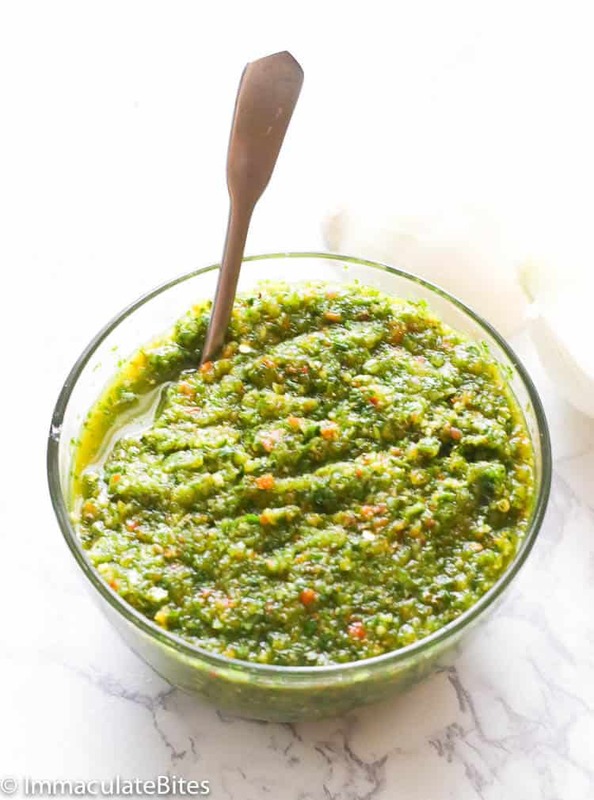 If you missed my sofrito recipe, it is actually a very versatile aromatic green puree made of bell peppers, tomatoes, cilantro, garlic and onions. 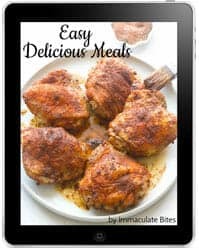 It makes a powerful base for dishes like stews, beans and rice dishes with different variations among the Caribbean, Latin America and other Spanish-speaking countries. How is it different with Jamaican Rice and Pigeons Peas? 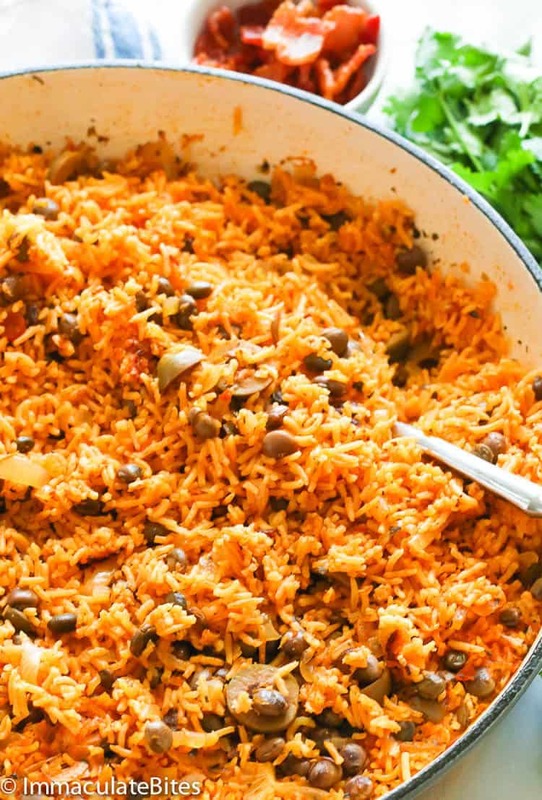 If sofrito isn’t in the neck of your woods, don’t worry, you can go with this Jamaican Rice and Pigeons Peas recipe instead. Coconut rice is cooked with plump pigeon peas, sweet corn and traditional Jamaican spices in creamy coconut milk with a hint of smokiness from smoked paprika. It’s both delicious in its own way. Want more flavorful rice recipes like this?? Heck yeah, I got boatloads for you. Check out this list of rice recipes HERE. 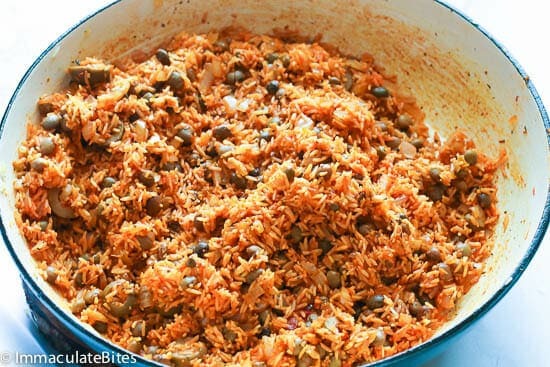 Don’t wait for Christmas or special days to make this Arroz con Gandules. It’s very tender, aromatic and very flavorful rice dish with complementing textures from pigeons peas and olives. And oh, did I not mention that it reheats well? Now go make a big pot of this, reheat the leftover the next day and top it with an egg. Aside from long grain rice, you can also use medium-grain rice. Avoid making this dish with shirt-grain rice as it gets too sticky and mushy. If you don’t have homemade sofrito, you can buy store-bought in Latin, Spanish and Caribbean markets. Some big groceries carry them in the international food aisle. You may substitute bacon with pork and the drippings with olive or canola oil. However, I love using bacon as the bacon drippings boost the flavor of this dish. As for those who’d ask if rinsing the rice is important, I’d say, YES. Rinsing the rice washes away the excess starch coated in it which makes the rice sticky. If you can’t find canned pigeons peas, you can go with pinto or red beans. 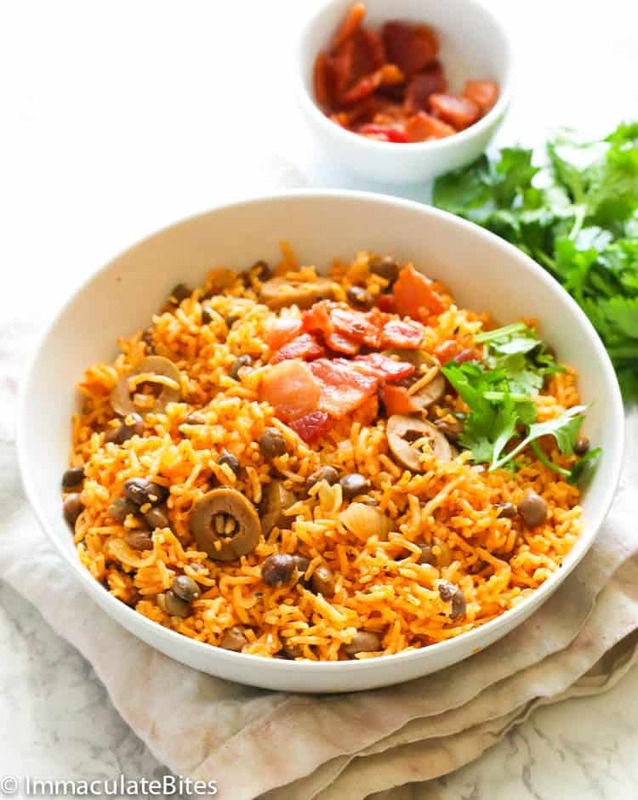 Arroz con Gandules - a classic Puerto Rican savory rice dish cooked with meat, gandules (aka pigeon peas) and some olives then spiced up with a homemade sofrito for an extra delicious rice meal! Wash rice until water runs clear. Drain water. In a large skillet over medium heat, sauté bacon until brown and crisp. This may take about 5-5 minutes. Remove bacon from skillet and transfer to a plate. There will be some bacon drippings left in the pan (about 1-2 tablespoons). Pour about 1-2 tablespoons oil to the pan then Add sofrito to the skillet , until fragrant ,about 2-3 minutes. Throw onion, garlic and cumin to the pan. Sauté for about a minute. Stir in rice and continue stirring for about 1-2 minutes. Then add gandules, tomato sauce, olive , sazon and water. Bring to a boil and reduce heat; cover with a lid and simmer until rice is cooked, about 18 minutes or more. Stir occasionally from the sides to prevent burns, add more water if needed. Wash rice until water runs clear. Drain water. In a large skillet over medium heat, sauté bacon until brown and crisp. This may take about 5-5 minutes. Remove bacon from skillet and transfer to a plate. There will be some bacon drippings left in the pan (about 1-2 tablespoons). Pour about 1-2 tablespoons oil to the pan then Add sofrito to the skillet , until fragrant ,about 2-3 minutes. Then add gandules, tomato sauce, olive , sazon and water. Bring to a boil and reduce heat; cover with a lid and simmer until rice is cooked, about 18 minutes or more. Sofrito does not have any “heat”. Most sofrito is made with bell peppers. You can do research to tweak your sofrito recipie (as I have an allergy to bell peppers an authentic Puertorican sofrito made much more sense to me and my abuelo aka grandpa). Puertorican rice was a daily staple in our house, while growing up it was one of the first foods introduced to kids. So, no “heat”. Looking ato so many reciepies posted this one is most like what my grandmother made regularly. Enjoy. Thanks for taking time out to share with us. Appreciate the feedback. Thank you very much for your wonderful site. The recipes are usually different and great. I do have a complaint about your site, though. That window labeled “My Latest Recipes” that starts automatically makes me crazy. I’m sure you were told that is is good to attract attention, but to me, it distracts from the rest of you page. Sometimes I just shut your page down out of frustration at the intrusion to my concentration with your otherwise excellent site. I hate to complain but this does annoy me to no end. Thank you again for an otherwise terrific effort !!! I ordered the sazon, sofrito and gandules online just so I can make this dish. Being lazy about making the sofrito from scratch. It just seems so great, I can’t wait to try this. My question is about the sofrito I ordered online : Goya Recaito & Goya Sofrito Cooking Base came in a set. The Sofrito is red and the Recaito is green. I’m wondering if I should mix them because in your recipe, the sofrito is green. Thanks. I made this tonight. It was quite good, but did not have as much “heat” as I expected. Maybe sofrito has no heat. I don’t know. I didn’t do the homemade sofrito so that’s a difference from your recipe. I did 2 Tablespoons of the Goya Sofrito and 1 Tablespoon of the Goya Recaito. My teenager has a keen palate. He’s mostly about the Mexican cuisine. He could eat it every day, but he’s not into the rice part of it. I’ve made some good Mexican rice in my day. The red, the green. Sometimes I impress myself with the results. But he’s always meh on the rice. This rice- he loved this rice. He wolfed it down. We all loved it. I might have to spice it up more, but this is definitely the rice I will be making from now on.